EXECUTIVE SUITES office space includes the services and amenities you need to operate your business or professional practice. Midtown Memphis Executive Suites is an owner occupied and owner managed office building centrally located in midtown Memphis, Tennessee. Since our offices are in the same building, we are available to quickly address any concerns or needs. This professional office building offers high visibility and is conveniently located adjacent to Overton Square. There are solo and small law firms in building. 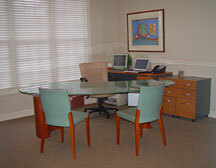 There is plenty of parking, a shared reception, a conference room printer/copier/fax/internet, and a kitchen.